I have a set (2k - 4k) of small strings (3-6 characters) and I want to cluster them. Since I use strings, previous answers on How does clustering (especially String clustering) work?, informed me that Levenshtein distance is good to be used as a distance function for strings. Also, since I do not know in advance the number of clusters, hierarchical clustering is the way to go and not k-means. Although I get the problem in its abstract form, I do not know what is the easie way to actually do it. For example, is MATLAB or R a better choice for the actual implementation of hierarchical clustering with the custom function (Levenshtein distance). For both software, one may easily find a Levenshtein distance implementation. The clustering part seems harder. For example Clustering text in MATLAB calculates the distance array for all strings, but I cannot understand how to use the distance array to actually get the clustering. Can you any of you gurus show me the way to how to implement the hierarchical clustering in either MATLAB or R with a custom function? This may be a bit simplistic, but here's a code example that uses hierarchical clustering based on Levenshtein distance in R.
In this example, we create a set of 30 random char(5) strings artificially in 3 groups (starting with "aa", "bb", and "cc"). We calculate the Levenshtein distance matrix using adist(...), and we run heirarchal clustering using hclust(...). Then we cut the dendrogram into three clusters with cutree(...) and append the cluster id's to the original strings. ELKI includes Levenshtein distance, and offers a wide choice of advanced clustering algorithms, for example OPTICS clustering. Stahlberg, F., Schlippe, T., Vogel, S., & Schultz, T.
Word segmentation through cross-lingual word-to-phoneme alignment. Spoken Language Technology Workshop (SLT), 2012 IEEE. IEEE, 2012. We would of course appreciate additional contributions. While the answer depends to a degree on the meaning of the strings, in general your problem is solved by the sequence analysis family of techniques. More specifically, Optimal Matching Analysis (OMA). Most often the OMA is carried out in three steps. First, you define your sequences. From your description I can assume that each letter is a separate "state", the building block in a sequence. Second, you will employ one of the several algorithms to calculate the distances between all sequences in your dataset, thus obtaining the distance matrix. Finally, you will feed that distance matrix into a clustering algorithm, such as hierarchical clustering or Partitioning Around Medoids (PAM), which seems to gain popularity due to the additional information on the quality of the clusters. The latter guides you in the choice of the number of clusters, one of the several subjective steps in the sequence analysis. In R the most convenient package with a great number of functions is TraMineR, the website can be found here. Its user guide is very accessible, and developers are more or less active on SO as well. 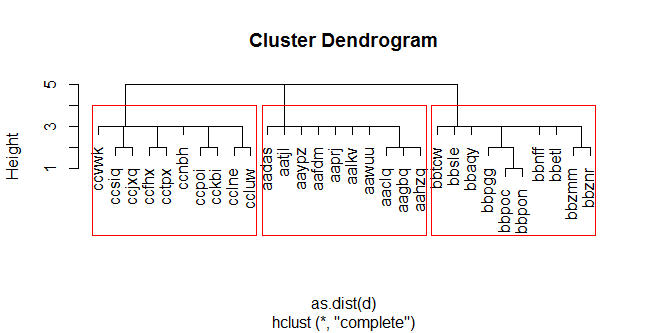 dist.om1 is the distance matrix obtained by OMA, cluster membership is contained in the clusterward1 object, which which you can do whatever you want: plotting, recoding as variables etc. The diss=TRUE option indicates that the data object is the dissimilarity (or distance) matrix. Easy, eh? The most difficult choice (not syntactically, but methodologically) is to choose the right distance algorithm, suitable for your particular application. Once you have that, being able to justify the choice, the rest is quite easy. Good luck! The authors explain how to cluster a dictionary using a modified (PAM-like) version of iK-Means. Not the answer you're looking for? Browse other questions tagged r matlab cluster-analysis levenshtein-distance hierarchical-clustering or ask your own question. How does clustering (especially String clustering) work?